This has truly been a season of unpredictability. The Cal game turned out much different than I thought it would a month, hell, even a week ago. The good news is that things appear to be trending positively, as we all witnessed the improvement on both sides of the ball against the Golden Bears. I found some other improvements within the game that I have not seen noted from other sources. These could have a big impact down the stretch for our Ducks. Fans have been lamenting the play-calling and the inability to run outside this year, and I have now determined why: Vernon Adams is much slower than I previously realized. Accordingly, the Inside Zone Read plays became simply “Inside Zone” plays, with no read, as Vernon just handed the ball off. Without a QB who can run effectively on the backside of the play, the defense is under far less pressure. No wonder offensive coordinator Scott Frost had trouble calling plays in the Red Zone! Imagine my surprise with the first play of the second quarter (see above video) when Adams took off scrambling for the first down … with more than adequate speed! He is not blazing, but it made me sit up as it could be a game-plan changer going forward. This is the running quarterback I saw in the Eastern Washington videos! Has the Zone Read now returned to the playbook? A pretty clear Zone Read! My Oregon friends … what you see above is the beginning of a classic Outside Zone Read play and it is obvious that Adams is looking right at Jonathan Johnson (No. 11) of Cal and reading him. He is not being blocked and since this defender has decided to “sit,” then the decision is to hand off as Vernon did to Kani Benoit, and the play goes for big yardage! The blocking on this play is simply superb (above) as Cameron Hunt (No. 78) takes the linebacker, and Tyrell Crosby (No. 73) moves the defensive end beautifully to create a massive running lane. Of course, nothing happens on the perimeter unless the blocking by the receivers is precise and sustained, as it is above. 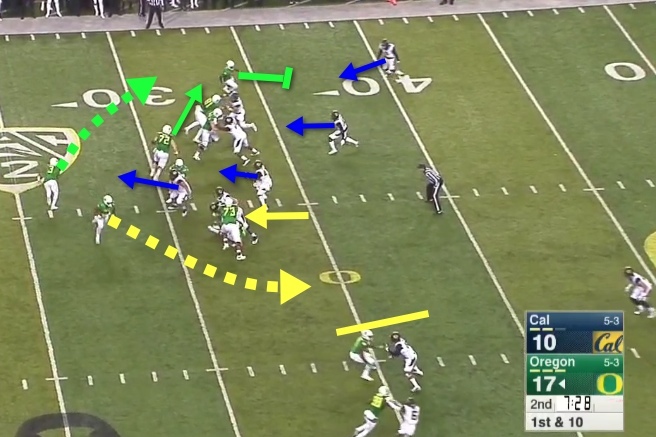 What we see above is a weird, but effective new play for Oregon. It is an Outside Zone play going to the right, with the center pulling and leading the way for the QB going to the left side. You can see how Crosby (yellow arrow pointing to No. 73) has blocked down and secured the outside, while the Duck wide receivers have begun to set up a wall pinning in the defenders on the outside. A nice running lane is created to the right. Yet to the left is center Matt Hegarty (No. 72) pulling to lead the way for Adams to run if he chooses. Note how they actually have attractive numbers to the left for blocking and creating a positive play, and also how the Cal defenders appear focused on Adams (blue arrows). This play works to the right because of the threat to the left of a running quarterback! It is debatable which direction would have been best (see video above), but we cannot question the results of the play. My questions to you coaches out there is this: Is there a Zone Read taking place on a linebacker or safety on this play? I did not detect it. Secondly, what would you call this strange but nasty new play that attacks horizontally so well? I love how it truly spreads the defense out and utilizes the talents of their offensive linemen to block in open space, as well as the dynamic receivers who secure the perimeter with their tenacity. 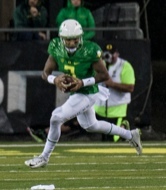 Vernon Adams on the move. I believe Adams sustained a lower-body injury of some kind, which has now evidently healed along with his finger. An injury that none of us knew about would explain why he was so slow running for nearly two months, and why the coaches removed running options for the QB in the offensive game plan. Having a legitimate option for a QB keep in plays such as the Inside Zone Read, the Outside Zone Read, and the Sweep Read changes how a defense will line up, and keeps it from focusing entirely in one direction. The biggest impact of returning to the Zone Read? When the Ducks read a defender, they are not blocking him, thus the blocking responsibilities shift over by one man to the play-side. Hence they get an extra blocker on play-side. This makes all the difference in the world for Oregon. For example, instead of a safety being free to jam up the edge, the Ducks will now have hat-on-hat blocking on the Outside Zone Read. 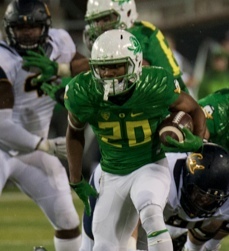 Oregon’s running game will explode from here on out, as seen in the Cal game. Royce Freeman has been our backbone this season, the true workhorse of the offense. However, in the Rose Bowl last year, I saw a tired, burnt out running back who had no moves, wiggle or burst, and that was after a month off for rest. Fast forward to this season, and Freeman has (IMHO) clearly lost some burst and wiggle since the first game this year. The emergence of three other running backs who have shown good skills in running our basic plays gives me hope that we can ration his carries to stretch his abilities further this season. Tony Brooks-James was a running back that I had given up hope on. In the early games he played in this fall, it appeared he was simply a north-south runner, that although he was fast, could not make anyone miss in the open field. We heard he had an injury some games back, and against Cal we saw the RB we had heard stories about as a scout team phenom in 2014. He was making Golden Bears miss, he was breaking tackles and he slashed his way for a huge 14.4 yards-per-carry average. Like Adams, I think there was an undisclosed injury with Tony that must have occurred in fall camp. It has been a very pleasant surprise seeing TBJ and VA run the football at their full potential! The defense in the Cal game made enormous improvements to become “adequate,” which is more than enough when our offense is clicking. While I would prefer having a near-perfect game on offense going into the game with Stanford, last Saturday was the best the offense has looked this season. It can be said that much of the game resembled the “Oregon Offense” we have come to know and love. They have a full stable of backs, the full spectrum of plays available and a quarterback who is very skilled in throwing the deep ball from the pocket. 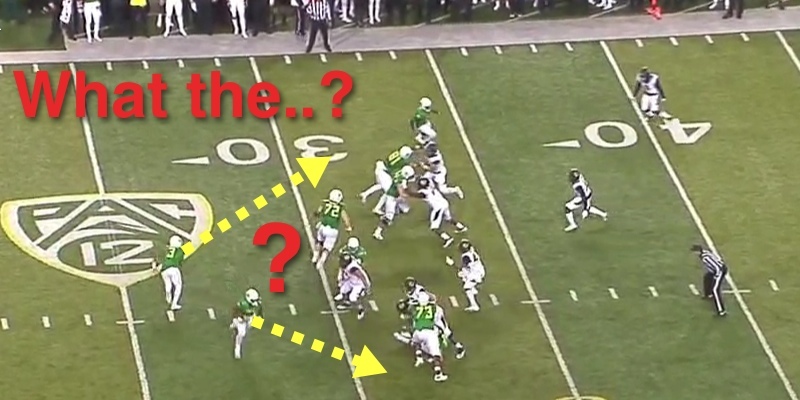 Our receivers must love Adams … they know if they get open, he will find them unlike few QBs they have had at Oregon. In short, the Ducks are in the best spot possible for a show-down with the Cardinal. I’m sure the coaches and players will enjoy the challenge and the next step in the progression of the 2015 Ducks.